“What’s it like to be a jealous god?” That’s the advice you’re given on how to play Despair, a nihilistic software toy by Lloyd Burchill meant to “[help] you vent some steam.” Basically, you kill a bunch of people using weird, supernatural powers. As grim as that sounds, Despair is surprisingly mellow, maybe even bored by the violence. It feels like a product of 90s cynicism, where everything sucked but in a cool, fun way you could rebel against. This premise easily could have been horrific if it was handled poorly. Thankfully, Despair tries to make it an inoffensive stress relief toy. The game has simple, black-and-white graphics, and there’s no blood, gore, or anything worse than slapstick violence. It’s fatalistic instead, like you may as well get blown up by dynamite. It has the same sense of humor as those parody motivational posters with depressing messages, possibly for the same crowd of frustrated office workers. The game gives you an assortment of 15 strange “threats” for murdering the endless stream of people falling onto the screen. Some are small (dropping a brick on their head). Others are big (opening a black hole). The obvious highlight is the “diseased ewe,” a runaway sheep that sickens anyone who gets close and freaks out everyone nearby. A good number of the threats just mess with people rather than hurting them, like a rolling block of foam rubber that pushes people out of the way. 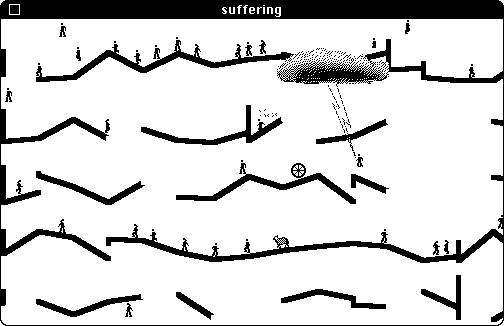 Despair combines these threats into a sandbox of torment and misery, best summed up by the title on the game’s window, “suffering.” The staggered platforms and ramps in the game resemble a Rube Goldberg machine with humans running around in a panic, falling down, bouncing around like basketballs, and blowing up. There’s potential for this to turn into a chain reaction of chaos, although disappointingly, the game isn’t well-suited for that. The threats have finicky timing, and syncing them up can be tricky, even annoying. If you wanted to instill mass carnage, it’s easier to pick one of the enormous disasters instead, like summoning a volcano. I had more fun slowly agonizing one or two people at a time. There’s mean-spirited pleasure in watching a stick figure run away from a wheel tumbling down a hill. The point of the game is to ruin the day for a few computer people, like digital voodoo dolls. The whole thing has a sense of ennui – the pathetic inevitability that every person will eventually get taken down by a diseased ewe or a neutron bomb falling out of the sky, no matter how much they try to escape. It’s funny to pester them, but in a dispiriting way: there’s no hope, and you may as well get a kick out of it. That’s kinda terrible, right? At times, I wondered why I was playing such a pessimistic game. A program called Despair, which has an icon of a person holding their head in their hand and wailing, probably welcomed that reaction. One of the threats in Despair is the “cziltang brone,” a device from Larry Niven’s Ringworld books that would allow solid objects to pass through a wall. People who walk next to a cziltang brone in the game will fall through the floor.